We had invited ourselves over to a friend and neighbor’s house in order to extract some sage advice. Naturally we offered to bring an edible and I settled on a healthy and oomphy salad. As I went about my day the phrase “honey roasted carrots” swirled in my head for no particular reason. I had a couple bunches of kale, a small handful of arugula. some chicken thighs, way too much milk and about 2 cups of buttermilk as well as, handily, a bunch of carrots. 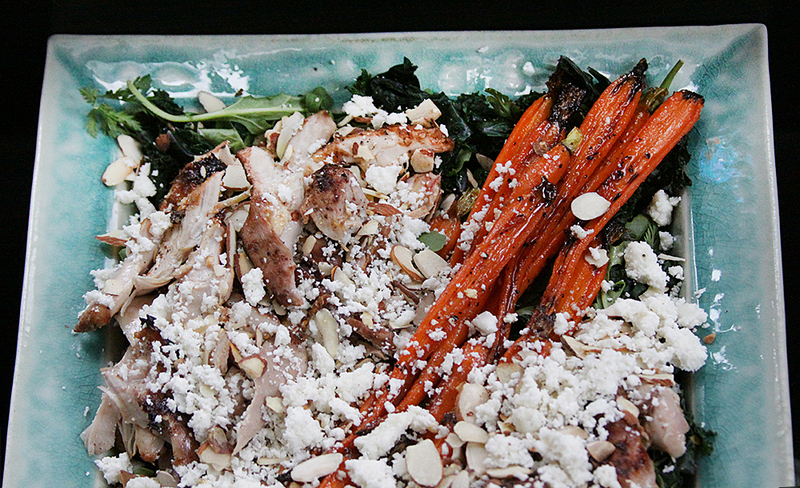 So I settled on a piled up salad with a kale and greens base, grilled chicken, homemade ricotta and sticky roasted carrots all tied together with an orange and some toasty spices. I first put the milk and buttermilk in a big pot and brought to a simmer until the curds separated. I ladled the curds into a damp kitchen towel in a strainer in the sink, squeezing gently every so often until it was slightly dry. Meanwhile I blanched and shocked the kale and tossed it with the arugula. The chicken I had marinated in orange juice and zest, olive oil, garlic, thyme, salt and pepper and was now grilling. 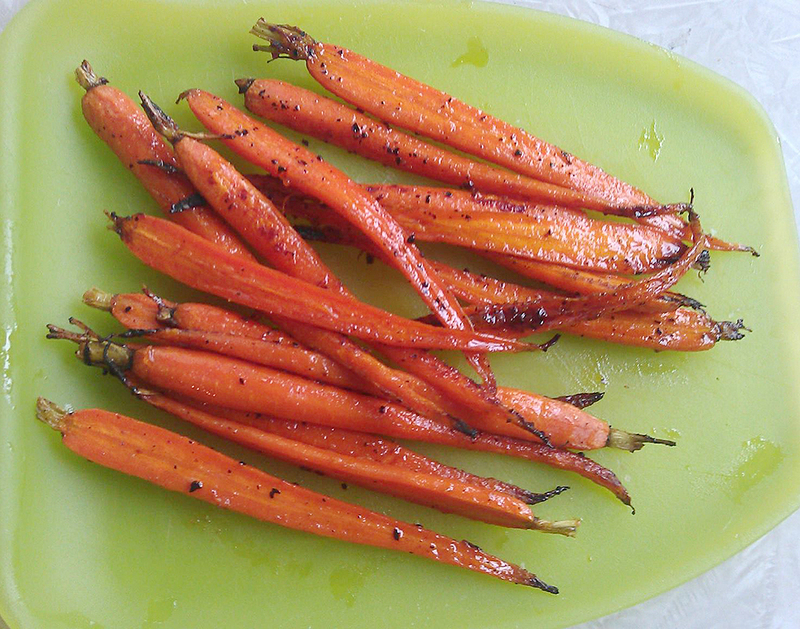 The carrots had been peeled, halved, tossed with olive oil and sprinkled with cumin, salt and pepper and were roasting in the oven. I had toasted some coriander, fennel and peppercorns for some sort of dressing when I realized I had used all the honey making some very good granola bars (more on that later). I was about to settle for just spiced carrots when I thought of using a jam of sorts. So I mixed a spoon each of apricot jam and orange marmalade, heated them until liquidy in the microwave and added a squeeze of orange juice. As soon as the carrots began to brown, I drizzled this mixture over them, tossed them, and sprinkled some urfa pepper on top. They then continued to roast until they were browned in spots and the skinny bits were caramelized into a kind of carrot candy. The ricotta was gently mixed with some lemon juice, salt and pepper and the whole lot layered on a platter. I added some toasted almonds and finished the dressing with orange juice, balsamic, mustard, olive oil, salt, pepper and the toasted spices. While I knew basically what to expect from the kale and chicken, it was the incredible brightness and complex, perfect flavor and texture of the carrots that just made me swoon. I had to ration the bites between bites of everything else so that the ratio was correct in the end. But now those carrots are gone and I know absolutely I will making them again and again. This entry was posted in Chicken, Salad, Vegetarian by Marina Chotzinoff. Bookmark the permalink.